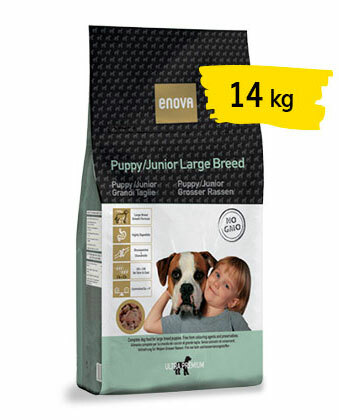 The Omega 6 & Omega 3 fatty acids can help to improve the conditions of coat & skin, and reducing the inflammatory processes (also in the joints), being therefore two times helpful in the large breed dogs; chicken fat, flaxseed and fish oil, quality fat sources, ensure adequate level of these essential nutrients. Not to forget the quality of the first ingredient, the chicken meat, that contains lots of high-biological value proteins, few ashes and is therefore highly digestible. Another important nutritional requirement of large breed dogs is the controlled Calcium/Phosphorus: it is known that an nutritional excess of these two elements can cause serious troubles. The inclusion of vegetables (carrots, tomatoes and rosemary) provides extra antioxidants and vitamin precursors that can help to keep the dog young and healthy. 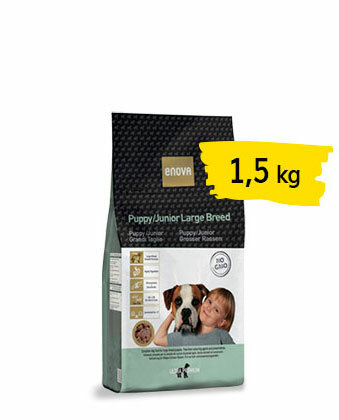 Everybody knows that big dogs have particular nutritional requirements, and this was the guideline for the formulation of ENOVA ADULT LARGE BREED, a maintenance food purposely created for dogs weighing 30 kg or more; this product contains everything the large breed dog needs in the correct ratio. The very high glucosamine & chondrotine integration is always useful in large dogs, whose weight can stress the joints and, with the time, lead to arthritis. Dried chicken meat, rice, barley, brown rice, poultry fat, rice bran, egg powder, dried beet pulp, flaxseed, protein hydrolysate, dried yeast, fish oil, dicalciumphosphate, cellulose, dried carrots, dried tomato pomace, dried seaweed, sodium chloride, potassium chloride, glucosamine, chondroitine sulfate, rosemary. Antioxidants: tocopherols, propyl gallate. Energy: 15,4 MJ/kg – Glucosamine: 1.000 mg/kg – Chondroitine: 1.000 mg/kg. Vitamin A: 12.000 IU – Vitamin D3: 1.200 IU – Vitamin E: 70 mg – Copper (as copper sulfate): 10 mg.